In Presentation Editor, you can insert images in the most popular formats into your presentation. The following image formats are supported: BMP, GIF, JPEG, JPG, PNG. once the image is added you can change its size and position. Size - is used to view the current image Width and Height or restore the image Default Size if necessary. Replace Image - is used to load another image instead of the current one selecting the desired source. You can select one of the options: From File or From URL. The Replace image option is also available in the right-click menu. When the image is selected, the Shape settings icon is also available on the right. 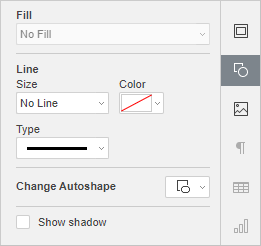 You can click this icon to open the Shape settings tab at the right sidebar and adjust the shape Stroke type, size and color as well as change the shape type selecting another shape from the Change Autoshape menu. The shape of the image will change correspondingly. Size - use this option to change the image width and/or height. If the Constant proportions button is clicked (in this case it looks like this ), the width and height will be changed together preserving the original image aspect ratio. 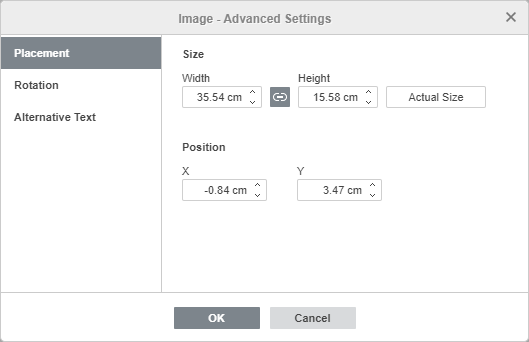 To restore the default size of the added image, click the Default Size button. 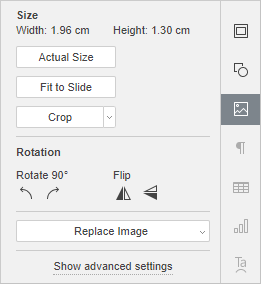 Position - use this option to change the image position on the slide (the position is calculated from the top and the left side of the slide). 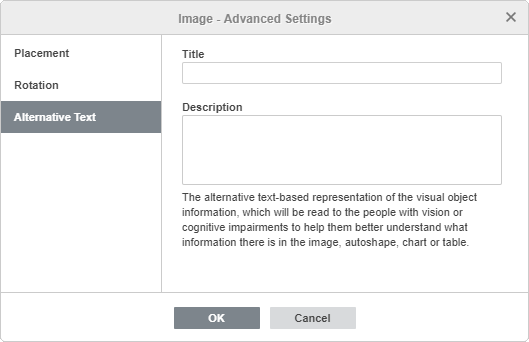 The Alternative Text tab allows to specify a Title and Description which will be read to the people with vision or cognitive impairments to help them better understand what information there is in the image. To delete the inserted image, left-click it and press the Delete key on the keyboard. To learn how to align an image on the slide or arrange several images, refer to the Align and arrange objects on a slide section.